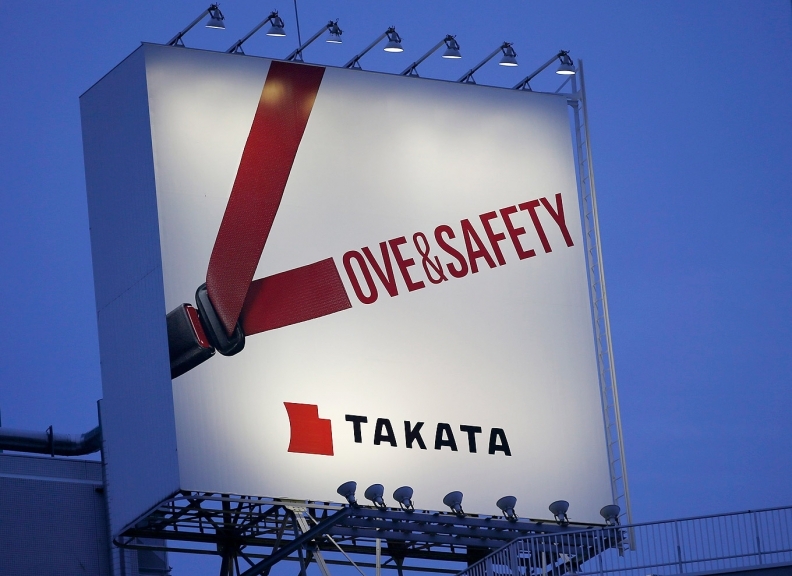 WASHINGTON/DETROIT -- Takata Corp. agreed to plead guilty to criminal wrongdoing and to pay $1 billion to resolve a U.S. Justice Department investigation into ruptures of its airbag inflators linked to at least 16 deaths worldwide. The deal was announced on Friday hours after prosecutors in Detroit charged three former senior Takata executives with falsifying test results to conceal the inflator defect, which triggered the world's biggest automotive safety recall. Takata will pay a $25 million fine, $125 million in a victim compensation fund, including for future incidents, and $850 million to compensate automakers for massive recall costs, the Justice Department said. The supplier will be required to make significant reforms and be on probation and under the oversight of an independent monitor for three years. The company's shares rose 16.5 percent in trading in Japan on news of the anticipated settlement, in which it agreed to plead guilty to a single felony count of wire fraud. The settlement, which must still be approved by a federal judge in Detroit, could help Takata win financial backing from an investor to potentially restructure and pay for massive liabilities from the world's biggest automotive safety recall. "Reaching this agreement is a major step towards resolving the airbag inflator issue and a key milestone in the ongoing process to secure investment in Takata," Shigehisa Takada, chairman and chief executive of Takata, said in a statement. He added that the company "deeply regrets the circumstances that have led to this situation and remains fully committed to being part of the solution." Starting in 2000, Takata submitted false test reports to automakers to induce them to buy faulty airbag inflators, according to the Justice Department. Takata made more than $1 billion on the sale of the inflators and Takata executives fabricated test information about their performance, the department said in a statement. A federal grand jury separately indicted three longtime Takata executives, all Japanese citizens, after a more than two-year U.S. criminal probe. Shinichi Tanaka, Hideo Nakajima, and Tsuneo Chikaraishi were indicted on wire fraud and conspiracy charges for allegedly convincing automakers while at the supplier to buy "faulty, inferior, non-performing, non-compliant or dangerous inflators" through false reports." The Justice Department said the three were suspended in 2015 and not currently working for Takata. The six-count indictment, unsealed on Friday, said they knew around 2000 that the inflators were not performing to automakers specifications and were failing during testing, but they provided false test reports to automakers. The inflators can explode with excessive force, launching metal shrapnel at passengers in cars and trucks. Many of those killed were involved in low-speed crashes that they otherwise may have survived. To date, 11 deaths and 184 injuries have been linked to the inflators in the United States. "They falsified and manipulated data because they wanted to make profits on their air bags," U.S. Attorney Barbara McQuade told a news conference in Detroit. McQuade, a self-described "soccer mom," said Takata had knowingly exposed her to the risk that a minor car accident would "send a metal projectile into my face." Takata has 30 days to pay the $150 million for victim compensation and the criminal fine and then up to a year to pay the remaining $850 million, or within five days of securing a financial backer. Reuters reported in November that Takata may file for bankruptcy as part of a restructuring. In recent years, the Justice Department has had an unprecedented number of criminal investigations into wrongdoing by automakers and suppliers, reaching major settlements with Toyota, Volkswagen, General Motors among others. The Justice Department said it had recommended together with Takata that Ken Feinberg, a compensation expert, oversee the automaker and victim compensation funds. The recalls have affected 19 automakers to date. Regulators have said recalls would eventually affect about 42 million U.S. vehicles with nearly 70 million Takata air bag inflators, making it largest U.S. auto safety campaign ever. Regulators expect it will take at least another three years to begin all of the recalls; just 12.5 million inflators have been repaired to date. In 2015, Takata admitted in a separate $70 million settlement with U.S. auto safety regulators that it was aware of a defect in its air bag inflators but did not issue a timely recall. The settlement announced Friday will only provide a fraction of the money for automakers who have been forced to recall millions of vehicles with the defective inflators. All but one of the 11 U.S. deaths have taken place in Honda vehicles. The Japanese automaker and Takata have settled nearly all lawsuits filed in connection with fatal crashes.